Ever met an evangelist? I met one recently in the pages of John Bunyan’s The Pilgrim’s Progress. 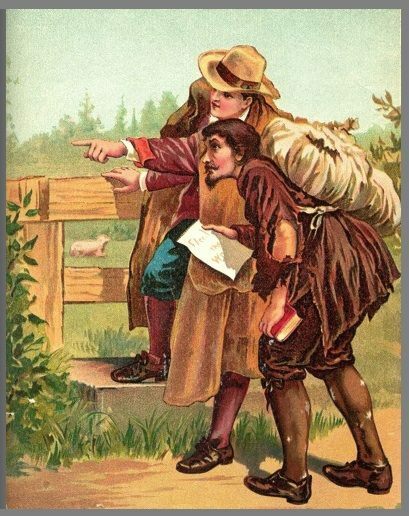 He is simply called “Evangelist” but it would be wrong to impose upon Bunyan’s character a modern understanding of an itinerant, American-style preacher. Rather, Evangelist here represents an important facet of the office of pastor which remains connected to the local church. No post-second great awakening figure here. Each of Evangelist’s three appearances reflect a distinctive aspect of the pastoral office, but it is his first appearance that got me thinking. His first appearance, at the start of the journey in the City of Destruction, is as a seeking evangelist/pastor who is on the lookout for burdened sinners. The parchment-roll he gives to Christian, the main character of the book, urges him to “Fly from the wrath to come” (Matthew 3.7 KJV), represents his ministry of proclamation from the Word of God. As Paul says to Timothy, “…do the work of an evangelist, fulfill your ministry” (2 Timothy 2.5b). Evangelist was a seeking pastor. You may not be aware but in the last thirty-five years it has been quite commonplace to replace the term “the lost” or “unbelievers” for those outside of the Church to seekers. I remember in our early days here when this discussion arose. The committee of the day just flat out did not like the old terms. “Seeker” was acceptable. We moved the lost into seeker category and so everything about us changed as a result. Seeker-sensitive services, liturgies, music and sermons were not far behind. We never realized that we were the problem. We forgot that only believers, see. That’s Bunyan’s point in the character of Evangelist: only believers with knowledge of the truth of Christ can see. Unbelievers have their minds blinded by the god of this world to keep them from seeing the light of the gospel of the glory of Christ (2 Corinthians 4.4). Our Lord Jesus Christ also declared that the Son of Man came to seek and to save the lost (Luke 19.10). Only those who can see can ever become seekers and only they know that they must preach Christ and pray that the God who said, “Let light shine out of darkness,” will shine in the hearts of the spiritually blind, giving them the light of the knowledge of the glory of God in the face of Jesus Christ (2 Corinthians 4.6). Pray that God opens blind eyes. The responsibility to seek is not with the spiritually blind lost person, but it is ours as believers, as seekers in the name of Jesus Christ. Sorry Jennifer, I am unsure where it came from specifically. I will try to find out.